So the big day finally arrived, Saturday 25 August 2018, D-day, Comp number 2 in Struisbaai for the Overberg Kobbies. Up at 4am, pack the bakkies and off we go to the pre-comp registration/briefing held at Struisbaai House Rentals. We are greeted by the aroma of brewing coffee and rusks compliments of Stefan Oosthuizen from Struisbaai House Rentals and hot samoosas provided by some members. With excitement in the air and guys sharing info on where the best place would be to fish for the day, we get the formalities out of the way and everybody leaves for their respective spots at 6am sharp. The weather forecast was closely monitored for the week building up to the comp and strategies and plans were made accordingly. 45kph NW/W winds with 60kph gusts were predicted for the day, with low tide being at 9am and high tide at 3pm and swells picking up from 3.5m to 6m. Some anglers opted to fish on the Plaat for the dropping tide and low tide but the vast majority of anglers headed towards the bricks in Cape Aghullas. Once we arrived at our spots we were greeted with gale force winds, making hard to even walk to the spots. Some of the “lightweights” needed some support against the wind. Lines in at 7am we are on the reefs ready to go. Casting was made extremely difficult by the wind but we somehow managed to get our baits out, all be it not exactly in the strike zone. A few Skaamies are landed but nothing else is happening besides the wind getting ever stronger. We were getting reports of the fishing being very quiet all over. After about an hour scratching around in that area we decide to pack up and walk to another area with nice working deep water. We have a drinks break and gear up for the reef hopping session to follow. We are about 14 anglers in this area and immediately everyone gets into some fish. The fish were gale just like the wind with lots of Hotties and a few Galjoen are landed with only a few fish making the minimum size for points. The wind gave us a break for about an hour and some decent fish were hooked and lost due to the area being so foul. We soon had to leave this area due to the tide pushing us off the reefs and after making our way out to dry land some anglers headed off to other spots towards Struisbaai and others opted to work the same area on the pushing tide. The wind now picked up stronger than ever and with 2 hours to go until lines up everybody was working hard to get fish on their cards. A few smaller steenies decided to make a brief appearance but that was about it. We got a few reports from other anglers who weren’t fairing too well either. At 3pm lines up everybody made their way to the prizegiving venue. Pelicans restaurant at Struisbaai Harbour accommodated us for our prizegiving. What an amazing venue overlooking the harbour. The guys arrived on time and some looked traumatized from the winds. While scores were being calculated, the guys are having a cold drink and sharing their experiences for the day while try to clear sand from their ears and places that’s not supposed to get any sand. All in all a tough day at the water with only 1 shark being landed, a Spotted Gully Shark of 163cm. Unfortunately, none of the edibles caught qualified for prizes. Prizes were given out to points scorers, mombakkies and some lucky draws. The prizegiving was concluded and everybody made their way home for a well-deserved hot shower and braai. 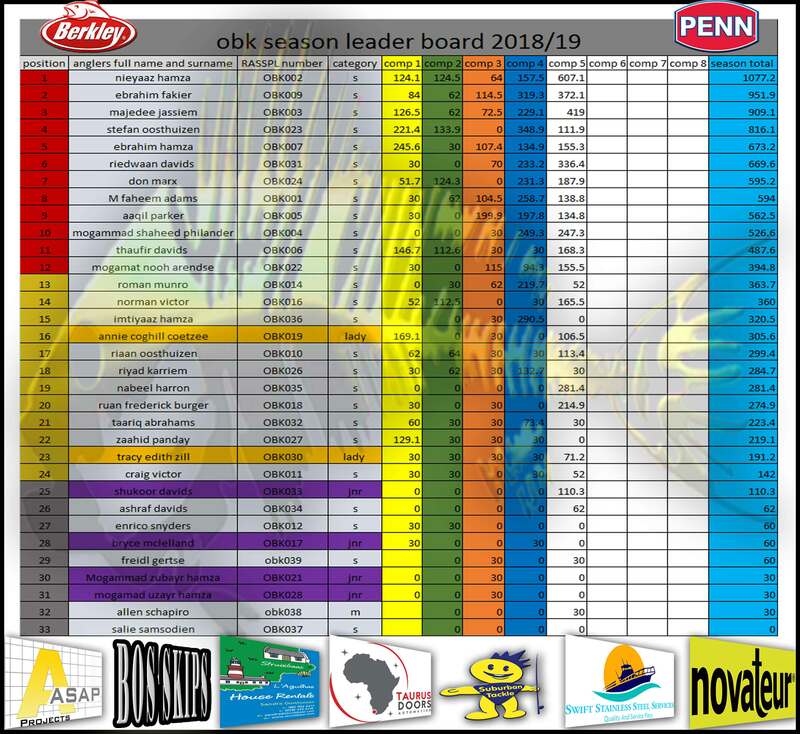 A BIG THANKS to our sponsors, Suburban Tackle, Taurus Doors, Struisbaai House Rentals, Swift Stainless, Penn Purefishing SA, Glassmen Epping, ASAP Projects 2012 and Mr Faiz Fakier for very generously sponsoring the amazing prizes for the comp. A big thanks to all RASSPL OBK members for making this comp a huge success. We can only grow stronger with a core of anglers like these! Looking forward to Comp 3 in Stilbaai on 22nd September 2018. See you all there.